In Tyler’s play, Jonathan visits the John Street Theater but thinks he’s attending church. (His minister had warned him against the theater and he never would have gone in had he known where he really was.) When the curtain goes up, he assumes he’s somehow peeping on the family next door. He describes his visit later to two New York servants, Jenny and Jessamy, who have a lot of fun at his expense: “Did you see the family?” Jenny asks, in on the joke. JONATHAN: Yes, swamp it; I see’d the family. JENNY: Well, and how did you like them? JONATHAN: Why, I vow they were pretty much like other families—there was a poor, good-natured curse of a husband, and a sad rantipole of a wife. JENNY: But did you see no other folks? JONATHAN: Yes. There was one youngster; they called him Mr. Joseph; he talked as sober and pious as a minister; but, like some ministers that I know, he was a sly tike in his heart for all that. He was going to ask a young woman to spark it with him, and—the Lord have mercy on my soul!—she was another man’s wife. JENNY: And did you see any more folks? JENNY: Aye! Who was he? JONATHAN: Why, he had red hair, and a little round plump face like mine, only not altogether so handsome. His name was—Darby;–that was his baptizing name; his other name I forgot. Oh! It was Wig—Wag—Wag-all, Darby Wag-all; . . . Okay. Let’s pause here for a moment. The layers of inside joking here are multiple: not only is the audience at the John Street theater listening to a character’s description of the audiences and performers in the John Street theater, but also to a discussion of plays staged only a few weeks prior to The Contrast’s debut, and starring the same company of actors. These jokes culminate in Jonathan’s description of “Darby Wag-all”: both characters—Jonathan in The Contrast and Darby in The Poor Soldier—were played by the actor Thomas Wignall; when Jonathan proclaims that Darby “is a cute fellow,” in other words, the actor is talking about his own appearance in a previous role. Jonathan’s theater escapade helps us catalog the play’s many “contrasts”: country vs. city, republican virtue vs. urban or European luxury, sentiment vs. politeness, revolutionary gravity vs. frivolity, democracy vs. aristocracy, veteran vs. beau, age vs. youth, New England vs. New York, marriage vs. seduction, patriarchal authority vs. filial insubordination, American homespun vs. imported European fashions. All these things, as you’d expect, boil down to the most obvious contrast in the play: between American patriotism and the unhealthy residue of British manners and fashion—between Manly, Maria, Jonathan, and country homespun on one side and Dimple, Charlotte, Jessamy, and imported British tastes and behaviors on the other. But we’re offered yet another contrast here that seems to undermine the ones I’ve already identified: the contrast between a sophisticated theater audience (represented by Jessamy and Jenny in the scene quoted above) and a bumbling rube, which is to say the contrast between theater-goers and the theater’s ignorant opponents. To the extent that Jonathan functions as an audience member he is a rather naive one, the object of multiple audiences’ scorn. Jonathan continually misreads the city: he assumes Jessamy is a member of congress, a brothel is a church, a prostitute is a deacon’s daughter, and the stage is a neighbor’s house. He’s been trained, also, to think of the theater as “the devil’s drawing-room” and actors as “wicked,” attitudes that place him at odds with the very form Tyler has taken up, and dangerously so, considering the theater was still illegal in his native Boston. Cold War critics, this production suggests, were completely snookered by Colonel Manly’s patriotic platitudes. 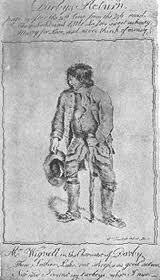 He seemed boring or priggish, sure, but no one really talked about him as the object of Tyler’s satire in the same way Tyler was clearly sending up the Anglophile fops and coquettes, Dimple and Charlotte, or the class-climbing servants, Jessamy and Jenny. 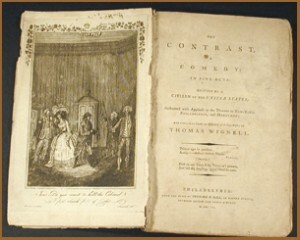 But in this production — and I suspect in the original as well — Manly and his sentimental counterpart Maria are shown to be as much the objects of Tyler’s satire as anyone else in the play. Manly’s declamations (as delivered by Rob Skolits) are meant to ring hollow and self-serving — to the point of hilarity, given his inability to see his own blind devotion to republican cliche. Maria Silverman’s performance as Maria leaves no doubt (from her first entrance singing a popular tune about a stoic Indian chief — her model of manly behavior) that Tyler was lampooning her rather than making her a virtuous alternative to the foolish, fashion-obsessed Charlotte, played pitch-perfect by Metropolitan veteran Amanda Jones. The Metropolitan’s cast and director have unlocked a hilarious streak in this play too long overlooked by literary scholars. It’s a subtle humor that has more sympathies with New York’s precariously polite urban society than scholars have previously tended to notice. When I was reading the play, I noticed that the sentimental characters, mainly Maria and Manly, were portrayed as being very grave and solemn. I had a hard time understanding why their sentimentality would cause them to be grave and a bore to society. In today’s society those of a sentimental nature are often seen as romantics, who are maybe not fully grounded in reality. Is this gravity Tyler’s way of satirizing these characters? Or am I just interpreting their sentimentality and gravity incorrectly? People who go to the theater in order to see/be seen are satirized in the play; sensible supporters of the theater know that shows are for watching, and well-behaved audiences should be quiet and receive the performance. This ideal, to my knowledge, proliferated American (nay, Western?) theater until very recently. Sure, you dress up and socialize before curtain and at intermission, and try to get into the post-show hotspots, but during the play nothing else should exist. I would like to suggest that we are now seeing a return to the presence of an audience as an integral part of the theatrical experience. Instead of relegating the audience to the role of mere spectator, not unlike at the movies, productions are forcing people to confront their peers during shows. Recent examples that come to mind: Roadkill Confidential at 3LD, Orlando at the CSC, and The Scottsboro Boys at the Lyceum. All of these shows, through lighting, direct address, and seating arrangements prevent the solitary theatergoer from losing herself in the show. Instead of forgetting herself and her problems, her mind solely in the world of the show, she must remember her role as a part of a larger body. In Roadkill Confidential, audience members are implicated as enablers of an artist’s ultimately inhumane methods; they sit in two sets of risers facing one another, and are as much a physical presence in the play as the actors. In Orlando, unrelenting direct address from actors plus a thrust stage draw attention to the theatricality of the events being played out, especially questions of fantasy vs. reality — how the audience’s very presence somehow validates Orlando’s life, makes his transformation and her fate something worthy of discussion. Finally, The Scottsboro Boys makes use of vaudeville, familiar American melodies, and American lore/tropes to remind the audience that their past is inseparable from the protagonists’ suffering, and racial inequality at large. The most aesthetically pleasing and catchy musical numbers/choreography are the heaviest in implication, the ones that degrade and marginalize the black performers — while forcing the audience to tap their toes and (at least aesthetically) enjoy said marginalization. I realize this has deviated a bit from The Contrast. Essentially, I think we ought not write off the unruly audience’s behavior as simply uncivilized. While the well-behaved bodies of “proper audiences” are perhaps favored over the one Jonathan experiences, at least the latter plays a role in the theatrical experience. Kabuki theatre in Japan is set up like a runway show, though I don’t know nearly enough about it to say much more. That’s an ancient practice, but of the three or four dozen productions I’ve seen this year, half or more implicated the audience in some way. Even when said audience involvement/notoriety is not intended, it does shape one’s theatrical experience: I might not like it when hoards of teenage girls cheer and text and take pictures in the American Idiot audience, but it is certainly a part of the show that I remember long after curtain call. And longevity, I think, is one of the traits of “successful” art — though that’s another discussion altogether! First a quick response for Rachel re: sentiment and gravity. You’re right that over time sentimentalism became equated with a lack of grounding in reality, but in the 18c (and even in the 19c, though in a slightly different way), the emphasis was on an ability to feel acutely the pain of others. Sensitivity might be a good synonym; sympathy is another one word used in similar contexts. Tyler is picking up on something beyond a mere overindulgence of emotion, though: he’s talking about “sentimentalists” almost as a social movement or a style. An equivalent for us might be “hippies,” in some stereotypical way that suggests both political position, sensibility, fashion sense, and groundedness is a particular historical moment all at the same time. Sentimentalists, as Tyler portrays them, are so caught up with feeling appropriately patriotic and grave that they don’t actually enjoy life all that much. (True esp for Manly.) Think about it in the context of antitheatrical prejudice: republican sentimentalists opposed wasteful activities like theater, card playing, and dancing. They’re also old-fashioned, sort of like hippies who kept being hippies even though the 60s had come and gone: in the 70s and 80s younger people sometimes thought of them as old farts. Same here. Boston had witnessed a big scandal right after the close of the war when a group of mostly younger people wanted to establish a social club for card playing and dancing. Old-guard republicans (the Manly types) fought like hell to shut it down. So when Tyler’s fun-loving characters complain about the sentimentalists, part of what they’re getting at is that their seriousness (how can you have fun when others are suffering in the world; how can you waste time dancing when we have SERIOUS things to do like form a new republican government) makes them boring socially. You’re right, though, that some strains of 18c sentimentalism–an almost masochistic delight in imagining the suffering of others, for instance–would make its way into Romanticism. By the time Harriet Beecher Stowe is writing novels we call “sentimental,” however, she keeps the emphasis on imagining others’ suffering but for her it’s a form of realism, not romance. Does that help? Anyone have something they’d care to add or another way to narrate the history of sentimentalism? A few responses to Amanda, too. Thanks for bringing our contemporary theatrical moment into the picture. We’ll talk more about this when we discuss the emergence of separate performance styles and spaces for working class performers and audiences, which happens in the mid 19c, but for now I’ll just note that the dominant mode of audience behavior you describe didn’t emerge until later in the 19c. In Tyler’s day audiences were still rowdy, though we see people like him or Irving’s Jonathan Oldstyle starting to complain about that fact. Eventually middling audiences will want spaces of their own where audiences behave more quietly. But many theater patrons considered it their right to cheer or boo or throw things as a way to show their approval or disapproval of what was on stage. The main difference between 18c theater and what you describe is that the breakdown of the line between performers & audiences (which was characteristic of experimental theater & “Happenings” in the 1960s, too, for instance) isn’t quite the same thing as audiences asserting the right to throw things or disrupt the performance. Right? Thank you. Seeing the sentimentalists more as a movement puts their mannerisms into perspective better and makes much more sense. A comment on Amanda’s description of the breakdown between the performers and the audience that we are seeing more and more today. I think there is a distinct difference that we touched on in class on Wednesday about who is controlling the performance and interaction with the audience. The audience Irving describes is controlling the theater experience almost in spite of the actors whereas in theater today the interactions are encourage by the actors themselves, so for the most part they still keep control of the performance (Like in Hair how the actors come into the audience and choose spectators to dance with or interact with in some way). I think that the actors keep control allows the audience to interact without feeling the need to disrupt the show or throw things from the mezzanine (something that may seem quite barbaric in today’s society).